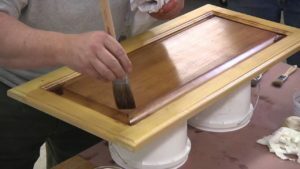 Brian’s career in wood finishing started in 1975. While attending college at night, he worked during the day at a family owned paint store for about 2 1/2 years. It was there that he learned more about color theory than anywhere else. After graduating from college, Brian decided he liked the paint & wood finishing industry. Brian then worked for various paint & finish supply companies until 1981, when he decided to learn the trade side of the industry. In 1987, Brian decided it was time to venture out on his own, mind you with no foreseeable work on the horizon. He made it a point from then on, to concentrate on wood finishing, so that he could distinguish himself as someone other than just another paint contractor. The majority of Brian’s work today is historical restoration mainly in the Pasadena area. Some of his projects have been, a permanent exhibit at the “Huntington Library” 1990, complete restoration of “Greene & Greene’s” the Robert R. Blacker House 1995-1997, complete restoration of “Charles Greene’s” personal residence, 1998, other “Greene & Greene” residences, & numerous pieces of furniture for private collections.